Argentina duck hunting is an outstanding South America bird hunt. Wanting to hunt in a stylish Argentina hunting lodge, eat exquisite Argentine cuisine, and surrounded by quality waterfowl, duck hunting in Argentina is the trip. Argentina is the best dove hunting for high volume shooting. Cordoba is home to the largest dove roost in Argentina. There is nowhere else in the world that a wingshooter can experience this caliber of dove hunting anytime of the year. Argentina perdiz hunting is without a doubt the most exciting Upland game and Los Gauchos offers high quality perdiz hunting in combination with dove - duck hunting. Argentina Upland hunting includes bird dogs that will impress any bird hunter. When it comes to Argentina bird hunting, Los Gauchos Outfitters stands alone at the top as the foremost brand in the country. A decade of doing it better than the rest has earned us many accolades, and we have appeared on television more than any other outfitter on the South American continent. Companies like Beretta, Benelli, and so many other consistently choose Los Gauchos as their destination of choice for one reason--we deliver! even though we began as duck hunting outfitters, our brand has grown to include every other wingshooting venue in Argentina and Uruguay, as well as fly fishing in Argentina. This is a time of year when a lot of friends, families, and business owners like to show some well- deserved appreciation for someone special?hopefully for us, that means that they will be taking them down to South America to enjoy the best dove hunting Argentina can offer; or maybe even go a little deeper, making it a trip for: dove - duck hunting Argentina combo. In any event, we would like to take this time to thank our employees and vendors for helping us make our Argentina dove hunting trips and Argentina bird hunting trips something special for our clients. Everyone has questions about Argentina bird hunting. Los Gauchos has been a reference and resource for over 10 years. Let us answer your questions and assist with your hunting trip to Argentina. See the frequently asked questions about Argentina from getting to Argentina to the shotgun shells used and other useful tips for those hunting and traveling in Argentina. The action does not stop with the doves though?one need only venture down to the beautiful Patagonia region of Argentina to share in what is certain to be the best quail hunting Argentina has to offer. This exciting wing shooting venue takes place over splendidly trained German Shorthaired Pointers, the estancia owner?s prized quail hunting dogs. This trip can be taken as a warm up to going dove shooting in Argentina, or it can be done afterward?a way to wind down from all of the intense gunning that is an every day part of dove hunting in Cordoba Argentina. Although Cordoba Argentina is know as the best place under the sun to hunt doves, there are other lesser know areas of the country that could compare Argentina dove hunting reviews to those enjoyed by Cordoba. In provinces such as Entre Rios, Santa Fe, and Santiago Del Estero, the dove shooting in Argentina takes a backseat to some exciting duck hunting in Argentina?duck hunting that is quite different from anything one might experience in North America. Here in South America, not only are the duck hunting seasons completely opposite, there are species of pintails, widgeon, and all kinds of teal that look nothing like those that one might find north of the Equator. After you experience the great wingshooting we have here in this country?no matter which trip you choose: quail hunting Argentina, dove hunting Argentina, or any other type of combination?you will never regret having taken the trip south to find out what all the other s have been saying, and living out the dream of what you have seen on an Argentina dove hunting video on any given day? When you book your trip with Los Gauchos, ask your host and guide to show you a little bit of the local flavor. In the Patagonia, our clients enjoy one of the best quail hunting lodges in the country. Our guests can hunt Valley Quail, fish for trout, and even enjoy the best out of a luxury lodge that is patronized by heads of state, and Fortune 500 executives. 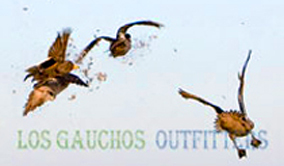 Yes, there is much more to Los Gauchos than just duck & goose hunting. Our portfolio of sporting destinations spans from Mexico to Tierra del Fuego. That is a lot of miles, and we are proud to walked them. What started as a dream over ten years ago, has now become a recognized brand of excellence in the sporting travel world. We want to share it with you. Won't you join us? Whether it is a Golden Dorado fishing trip in Uruguay, or your favorite kind of Argentina bird hunting, let us put our experience and attention to detail--which is our formula for success--to work for you. Nothing is more rewarding for us than to make our clients' wingshooting and fishing dreams become realities. As duck hunting outfitters, there is no rest for the wicked. Our quest for the best duck goose hunting in South America is constant. Like a surfers dream of catching the "perfect wave", our passion is finding the next "honey hole". We just know it's out there...and we will endure to find it--near, or far. Check for this years specials at our quail hunting lodges, and visit the Los Gauchos video web site for some exciting videos on all things hunting and fishing in South America. Los Gauchos believes that it is our responsibility (in addition to offering our clients the best dove hunting Argentina has to offer) to show appreciation for the local people and businesses that are located in the areas where we hunt?but it does not stop there. In addition to making every effort to do business with the local store owners and other suppliers, we also make donations of money and food to local schools, orphanages, and retirement homes. When you choose to make dove hunting Argentina a part of your future wing shooting plans (we realize that you have alternatives, such as dove hunting in Mexico, or even now days?dove hunting in Chile), you to can make a contribution to the local economy and charities here in South America. We find that this practice pays huge dividends. The locals know that they can count on us for our support, and whenever we need anything, they seem to always be ready and willing to help out. Although Cordoba Argentina is know as the best place under the sun to hunt doves, there are other lesser know areas of the country that could compare Argentina dove hunting reviews to those enjoyed by Cordoba. In provinces such as Entre Rios, Santa Fe, and Santiago Del Estero, the dove shooting in Argentina takes a backseat to some exciting duck hunting in Argentina?duck hunting that is quite different from anything one might experience in North America. Here in South America, not only are the duck hunting seasons completely opposite, there are species of pintails, widgeon, and all kinds of teal that look nothing like those that one might find north of the Equator. After you experience the great wingshooting we have here in this country?no matter which trip you choose: quail hunting Argentina, dove hunting Argentina, or any other type of combination?you will never regret having taken the trip south to find out what all the other s have been saying, and living out the dream of what you have seen on an Argentina dove hunting video on any given day? When you book your trip with Los Gauchos, ask your host and guide to show you a little bit of the local flavor. Read more about your favorite bird in Argentina - we have information about the Argentina bird hunt you want to take. Argentina Dove Hunting - high volume dove hunting all day anytime of the year. No limits, no season. 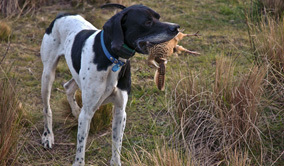 Argentina Perdiz Hunting - have to try this Upland hunt with dogs and birds that will challenge and excite any wing shooter. 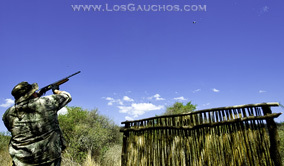 In addition to bird hunting, we now offer Argentina big game hunting as well. An assortment of red stag hunting, Puma hunting, and water buffalo are all in the mix. One of our best value mixed bag hunts is in the province of Santiago del Estero. Here one can enjoy great Argentina dove hunting by day, and bonus big game hunting at night! Argentina puma hunting is available at night for only $100 us dollars. The desert mesa of this province also has excellent Argentina stag hunting. We can't say enough about this "sleeper" trip. All who have done it, have enjoyed it thoroughly, and say it reminds them of quail hunting in Texas, with the added big game venue that most closely resembles a big game ranch near the Texas / Mexico border. The Argentina puma hunting here is excellent, with most hunters harvesting animals on the first night out. Please let us know in advance if you wish to add the large animal addition to your Argentina dove hunting package in Santiago del Estero. We will need a minimum of one weeks notice to do the necessary scouting for the Argentina big game hunting phase of the trip. Scouting is the all-important part of any hunting trip that separates the best hunting outfitters in Argentina from the rest, and in Santiago Del Estero, its no exception.